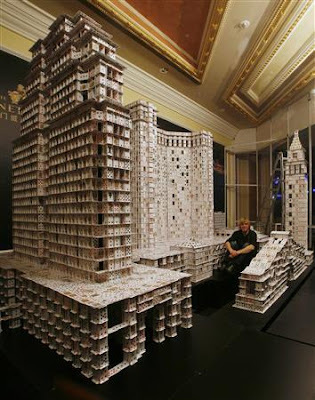 From the folks at Reuters.com..
Bryan Berg from the U.S. poses with a replica of the Venetian Macao and adjacent constructions built from freestanding playing cards at the Venetian Macao resort hotel in Macau March 10, 2010. Berg broke his own Guinness World of Records for the largest house of freestanding playing cards on Wednesday after a 44-day attempt by using 218,792 cards to build the project, which measures 10.5 meters (34 feet) long, three meters (10 feet) tall and weighs more than 272 kilograms (600 pounds). Picture taken through glass window. Anyone for a game of 52 million pick up?